One of Martha Stewart's first "Good Things" was a suggestion to dispense dish detergent into decorative glass bottles topped with a pour spout. I thought this idea was genius. I mean, who really wants to look at a plastic detergent bottle? I was probably one of the few students who HAD to have their dish soap elegantly displayed in their college apartment. As much fun as it was to shop for throw pillows and a bedspread for my place, that bottle was at the top of my must have list. 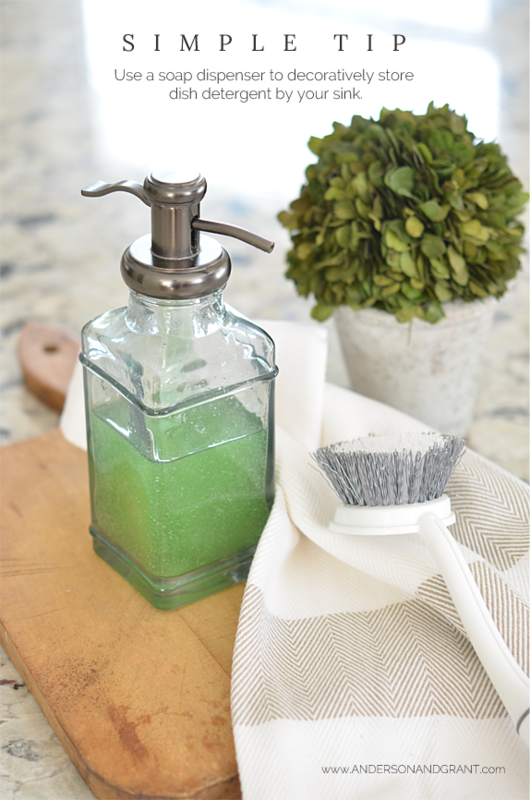 After all the years of using this idea, though, I believe that I have found an even better solution to storing (and displaying) dish soap by the side of your sink......a hand soap dispenser! 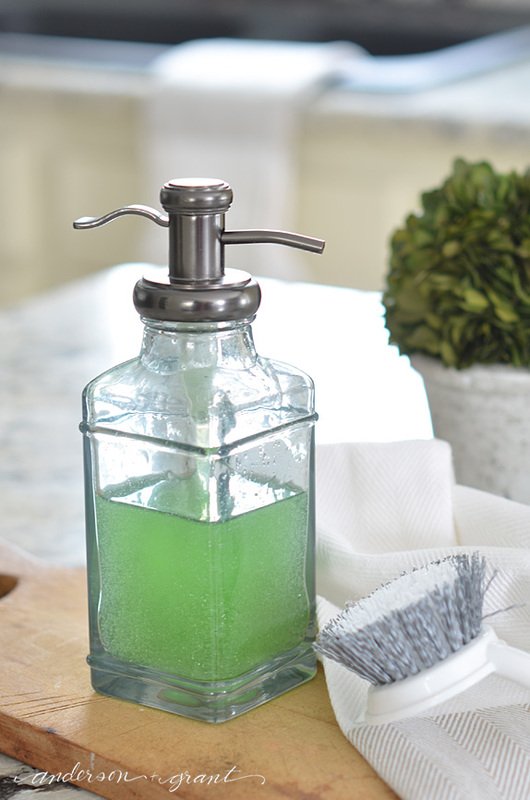 Pouring the dish detergent into a soap dispenser is equally as pretty and so much easier when adding the soap to your water. You just need a few pumps and are good to go. One of the downfalls of using the spout in the bottle was that the detergent came out slowly and sometimes got clogged. And in doing a little research I found that another downfall was household members assuming that the soap bottle was holding olive oil and adding it to the evening's meal. Ew! This new and improved idea eliminates those unpleasant problems. 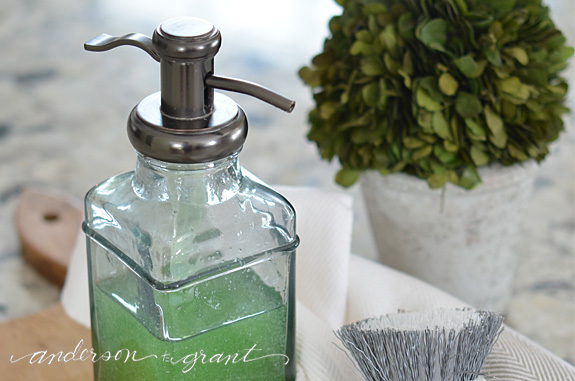 This soap dispenser was purchased at Target (affiliate link) in the bath section, but pretty hand soap bottles are available just about anywhere. You could even convert a mason jar into a farmhouse style dispenser simply by adding a pump. I'm loving this one on Amazon (affiliate link). Don't you think that this adds instant charm to the kitchen? This simple idea makes something typical so much more special. 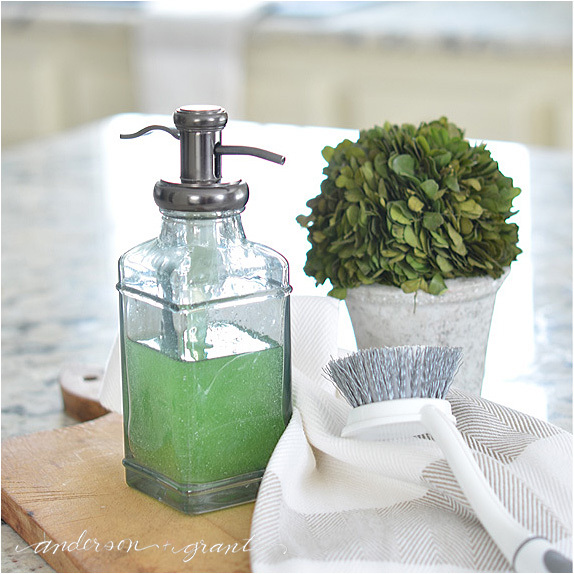 It is convenient to be able to leave the soap right there on the counter where you need it. Plus, you can buy the detergent in bulk saving money and cutting down on trash. So many benefits to one little idea! So I'm curious......How do you store dish detergent? And is this an idea you might try yourself?